As the excitement and drama of the 35th America's Cup reaches its peak, there is one University of Southampton student for whom the competition is just getting started. 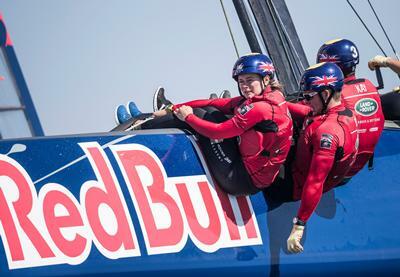 Annabel Vose, who has just completed her four-year undergraduate master's degree in Ship Science, has joined six other talented young British sailors in Bermuda to compete in the 2nd Red Bull Youth America's Cup. Selected as part of Sir Ben Ainslie's Land Rover BAR Academy team, Annabel brings a lifetime of sailing experience to her role as strategist which she says involves taking a 'big picture' approach to the fast-paced match racing the team will face. The Land Rover BAR Academy was inspired by four-time Olympic gold medallist and 34th America's Cup winner Ben Ainslie and created to find and support talented young British sailors, to provide a pathway into the America's Cup and specifically to build a British team that can win the Red Bull Youth America's Cup. Annabel and her fellow crew members will face other youth teams from around the world, all comprising of sailors aged 19-24, in racing the wing sail catamaran AC45F boats used by their senior counterparts throughout the Louis Vuitton America's Cup World Series during 2015 and 2016. The boats are designed to foil, rising several metres above the water's surface and reaching speeds of up to 30 miles per hour or more in group match-racing conditions. "In the Red Bull Youth America's Cup, we're sailing in such a massive boat that will be going very fast with everyone's heart rates at 170-180 on races lasting about 12 minutes or so where it's really difficult to communicate and challenging to make sensible decisions at times," says Annabel. "My role is strategy which involves seeing the big picture, keeping things calm on board, looking at the course and seeing how things are changing that might give us options during the races and saying things like 'it doesn't matter if we lose to that boat because we gain the other five'. "It can be pretty scary," she admits. "You're going so quickly across short courses and a lot can go wrong but that's where you get the adrenalin from." The 22-year-old from Southampton is already one of Britain's most talented young sailors having won four World Championships, including captaining the University of Southampton to gold at the World University Championship. She's also collected one European and ten National titles across a range of sailing classes and disciplines. Even with that legacy behind her, Annabel's qualification for the Land Rover BAR Academy was not a foregone conclusion. "The first opportunity to sail for the Land Rover BAR Academy came in April 2016," she recalls. "I went to the team headquarters in Portsmouth for a trial day. It was a long day with interviews, a look around the base, a chance to meet the team and Ben and then a really tough fitness test. "I qualified for the next round which was a sailing trial but it clashed with my exams so I couldn't make it and they picked their eight from that trial," she continues. "The Land Rover BAR Academy team sailed over the summer but they recommended that I do a bit more catamaran sailing so I continued to work on my fitness and gained more experience sailing GC32 catamarans in Cowes on the Isle of Wight. "I also did an internship over the summer months with North Sails as part oft Ship Science degree, working on their design offices which was really fun and I learned lots which really helped," she continues. "So having spent the summer essentially learning about sails and sailing catamarans, I got a call back in the autumn with Land Rover BAR, had another fitness test and was then accepted. "Since October, I've spent two days a week at the Land Rover BAR base in Portsmouth doing their gym sessions," she enthuses. "I've also been sailing in Weymouth on the Nacra 20 catamarans and spent two weeks in Oman in February for the 2017 Extreme World Sailing Series which was a lot of fun. In April this year, Annabel had her first close-up taste of the America's Cup when she travelled to Bermuda to train alongside the Land Rover BAR academy crew and the senior Land Rover BAR team. That week-long experience made quite an impact and she's now ready for the racing to begin. "It's really cool to get up at 6.30am in the hotel and everyone there is Land Rover BAR," she recalls. "I travelled with the team on the RIB every morning across to the base. It was really exciting. You're part of that whole team which includes the designers and shore team, the chefs and gym support, and a massive hangar to store all of the boats and other equipment - it just shows how much of a massive operation these things have become. "Returning for the Cup itself is going to be a really great atmosphere," she continues. "There are going to be so many people there and so many classes of boat that just to be involved in it all will be really special - and a bit of relief that you've been building to this moment and you actually finally get to race and do what you've been training to do." Of course, in the midst of all her sailing activities, Annabel has also kept up with her studies. With the full support of her lecturers, and a bit of extra work, she is on team to graduate in a few weeks' time. In fact, one of her major achievements academically links perfectly with her life at Land Rover BAR. "Our final-year group project has involved retro-fitting foils to a catamaran which was great fun and very successful," says Annabel. "We designed and built out own runners at Green Marine in Hythe and Land Rover BAR also gave us some carbon to compete the task. We then had three days of tow testing and one day of sailing and foiling which was great. So, after handing a 200-page project, and then competing in the Youth America's Cup, I'll be looking forward to returning to Southampton in July to graduate."